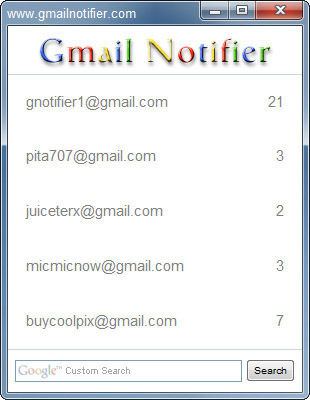 Gmail Notifier specially helps if you have more than one account. The maximum accounts you can set Gmail Notifier to monitor is 5 (see figure 1). Every two minutes Gmail Notifier will poll your accounts for new email messages. If new emails are present, it will fetch headers and then, will fetch body on demand.